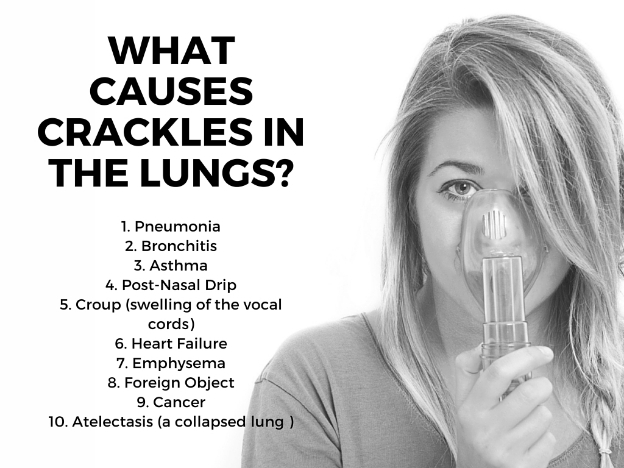 Home » Respiratory » What Causes Crackles in the Lungs? A crackle in the lungs is something that might be detected when your doctor checks you over with a stethoscope. What such a lung crackle might signify can vary, since all a lung crackle indicates on its own is that something is affecting air flow. For example, crackles in the lungs of children can have distinctly different causes than those in adults, crackles may only happen when exhaling or at night, sometimes crackling lungs only happens after coughing, and so on. The point is that this is a single clinical observation rather than a definitive condition. Learning a bit more about crackling lungs may not help you self-diagnose (unless you own your own stethoscope), but it can help you better understand your doctor and lead to a more informed relationship. Wheezes: A wheeze is a sort of high-pitched sound that comes from air trying to get through a narrowed passageway. Occasionally, wheezing can be pronounced enough that your doctor can hear it without a stethoscope. Rales: Rales have a bubbling, clicking, or rattling sort of sound that occurs when you inhale. They tend to happen when air enters an otherwise closed space. Rales can be further subcategorized as moist, dry, fine, or coarse depending on the nature of the sound. Stridor: Stridor is similar to wheezing but originates closer to the trachea and has a higher-pitched, almost musical quality. Stridor sounds are more likely to be the result of something obstructing the trachea or the back of the throat, and the sounds are more pronounced when inhaling. Rhonchi: Rhonchi falls under the wheezing category, but its sounds resemble snoring and happen in the larger airways. During rhonchi sounds, airflow may be blocked or is otherwise “rough” during its passage. Pneumonia can have viral or bacterial causes, but in all cases it’s characterized by an inflammation of the air sac in one or both lungs along with a possible buildup of fluids. When listening to your lungs, pneumonia crackles present as moist rales due to the movement of fluid within the air sac. Pneumonia can also cause something called an “E to A” change, which is when the letter “E,” if said aloud, sounds like an “A” through the stethoscope. Whether it’s acute or chronic, bronchitis is when the bronchial tubes become inflamed. Bronchitis is almost always the result of a virus and it tends to appear in the aftermath of a cold, flu, or similar illness. Bronchitis causes crackling lungs in the form of wheezing that may also sound moist. Asthma is a combination of the airways swelling, narrowing, and producing excess mucus. Consequently, asthma produces wheezing-type or moist lung crackles. Unlike bronchitis, asthma sounds are not necessarily tied to the bronchial tubes. Incidentally, asthma falls under the category of chronic obstructive pulmonary disease, of which almost all can cause wheezing. This is a possible cause if you hear crackling lungs when lying down but not when you sit up. Basically, what happens during post-nasal drip is that excess mucus from your nose makes its way down your throat and into the airway, where it can produce lung crackles that you can sometimes hear without a stethoscope. Croup is the term used to describe the swelling of the vocal cords, normally caused by a viral infection, and is identifiable by a cough that sounds something like a seal barking. Due to the narrowing of the airway, croup produces wheezing-type lung crackles. Children and infants between three months and five years of age are more likely to get croup, but it can occur at any age. Congestive heart failure can arise when the heart is damaged by physical injury, a prior heart attack, an infection, medication side effects, or genetic conditions, among other causes. Heart failure results in the gradual buildup of fluid in the lungs, a condition known as pulmonary edema. Moist rales can be heard when someone with edema tries to take a deep breath. The air sacs of the lung are spherical under normal conditions. Emphysema is what happens when these sacs weaken and burst, creating what amounts to holes in the lungs. This impairs the ability of your lungs to process oxygen (due to reduced surface area) and limits how much can get into the bloodstream. Emphysema also affects the elastic fibers that support the airways, making it harder to exhale. As a form of COPD, emphysema results in wheezing sounds as well as decreased breathing sounds when exhaling. Emphysema is normally the result of prolonged inhalation of smoke, pollution, or certain industrial fumes. You may be surprised to learn that it’s possible to have an object lodged in your throat without causing you to choke. In these cases, the partially obstructed trachea will produce stridor sounds. Blockages not caused by a foreign object can also arise, such as from swelling or a muscle spasm. Stridor is more common in children both because their airways are narrower and because they are more likely to put random objects in their mouths. A tumor can cause lung crackles depending where in the lungs or airway it’s located. If it’s in the trachea or vocal cord area, wheezing or stridor sounds are more likely. If the tumor is in the lung itself, rales or rhonchi might arise. This is the medical term for a collapsed lung, and it’s exactly what it sounds like. The lung, in part or in whole, collapses and becomes unable to effectively draw in air. Atelectasis normally happens because of sudden trauma, such as a car accident, or as a later complication of an already existing disease. If examined on a stethoscope, the lung sounds will be very weak and wheezing crackles may be detected. 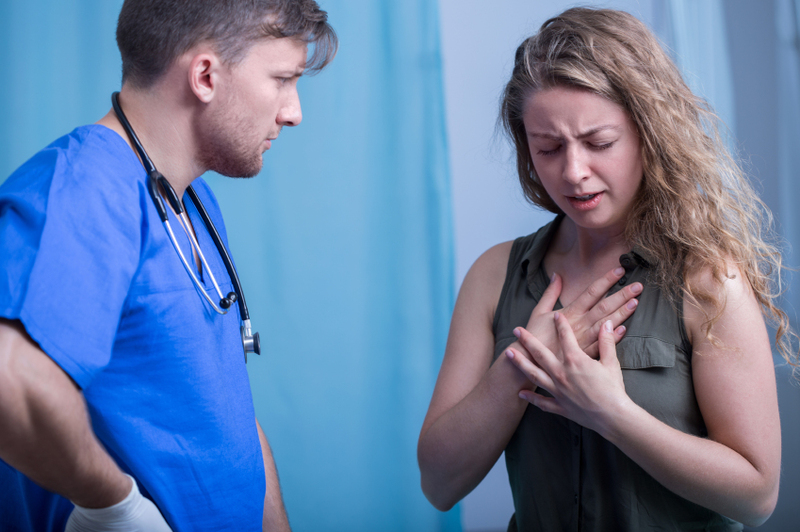 A collapsed lung is a medical emergency and the emergence of sudden, significant breathing difficulty and chest pain needs to be checked out immediately. more than others. For example, a humidifier can help treat post-nasal drip. Since lung crackles rarely appear in isolation, and because you can’t normally hear your own lungs that well, paying attention to other symptoms can be important in determining what’s wrong. Your doctor uses these other symptoms in addition to lung crackles when forming a final diagnosis. Not all of these symptoms appear in every case of lung crackles and the absence of some symptoms can be quite informative. Short of quitting smoking, trying to reach or maintain a healthy weight, not breathing in industrial fumes, and keeping swallowable objects away from small children, there are few methods that can be taken to avoid the causes of lung crackles. “Crackling in Lungs,” Just-Health web site; http://www.just-health.net/crackling-in-lungs.html, last accessed April 22, 2016. “Emphysema Treatment and Drugs,” Mayo Clinic web site, April 5, 2014; http://www.mayoclinic.org/diseases-conditions/emphysema/basics/treatment/con-20014218, last accessed April 22, 2016. “Stridor,” Medline Plus web site, last updated April 5, 2016; https://www.nlm.nih.gov/medlineplus/ency/article/003074.htm, last accessed April 22, 2016. “Croup,” Medline Plus web site, last updated April 5, 2016; https://www.nlm.nih.gov/medlineplus/ency/article/000959.htm, last accessed April 22, 2016. “Breath Sounds,” Medline Plus web site, last updated April 5, 2016; https://www.nlm.nih.gov/medlineplus/ency/article/007535.htm, last accessed April 22, 2016.